Hunger Wall is an elegant residence providing accommodation in fully serviced apartments. It offers the comfort, style, and amenities of an upscale hotel with the charm of a private accommodation. It consists of 18 luxury apartments, each uniquely designed and tastefully furnished. Although in the center, also in a neighborhood of 2 magnificant parks Petin and Kampa. 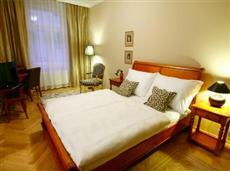 It thus offers peace and quiet right in the heart of the city, near the Old Town, Charles Bridge and Prague Castle. With its harmonious blend of style, comfort and professional service, Residence Hunger Wall is perfect place for leisure and business travel as well as executive relocation.